Hello Friends! Happy Friday! 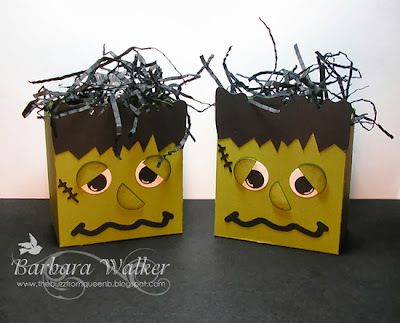 I have some fun Halloween treat boxes to share with you today. I wanted to post these because not only are they super cute, but they can serve as last minute 'thinking of you' gifts for your friends or co-workers. They were really fast and easy to make, too. The original idea is from Angie Juda of Chic n' Scratch. I just LOVE her style! I've been following her for years. As a matter of fact, she posted this project about four years ago. 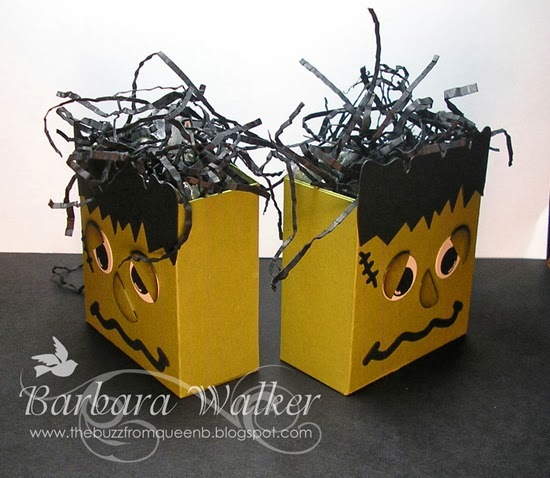 But, Frankenstein is timeless and these little boxes are adorable. Aren't they cute?! I followed Angie's video for the measurement of the boxes. But, I used a different size of punch for the eyes and nose. And for the little mouth, hair and scar, I used a Silhouette cut file from the PaperCrafter's Library member's only area. ~sorry. But, you could easily draw the mouth and scar and cut the hair using scissors. It holds a nice amount of candy, too. I have a cello bag with 4 mini York Peppermint Patties in one. And in the other one, I have a cello bag with six bite size Snickers bars. I put my candy in bags because I'm mailing it. It fits more candy without the bag. I made the crinkle hair by running my card stock thru a crimper, then cutting thin strips and balling them up in my hand to give them more texture. Another tip I learned from Angie! 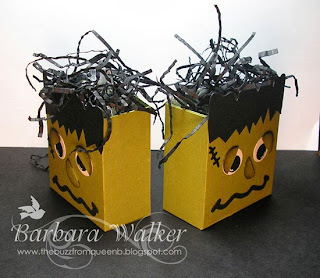 I've included the video for making the treat boxes here for your convenience. I hope you give it a try! They really are fun and easy. That's all I have for you today. Thanks for dropping in! Have a great weekend! Wow, these are great, Barb! I'm impressed that you remembered this project from years ago. I like all the details you've added to make the faces look great. And the crinkly hair-super tip. Thanks for sharing the blog, too. I used to follow it, but maybe need to revisit. Have a happy weekend, sweet Barb! So cute! 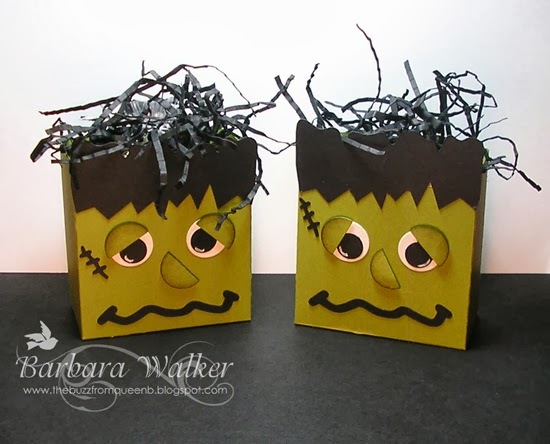 Thanks for sharing this adorable project, Barb.